The Lexus SC 430 switches from luxury hardtop coupe to open roadster with the press of a button. It’s quiet and secure with the top up, perfect for two people dressed for an evening on the town. Dropping the power hardtop converts it into an open roadster, enjoyable on those perfect spring days. Looking bolder and brighter for 2006, the Lexus SC 430 attracts attention wherever it goes. Its richly rounded styling is upscale and refined. Its interior, freshened for 2006, is luxurious and comfortable, trimmed in leather and a choice of rich woods. The SC 430 performs well and boasts true sports car credentials: rear-wheel drive, a fully independent suspension, and a powerful V8 engine. It’s stable at high speeds and offers excellent control on winding roads and freeway on-ramps. And it’s easy to live with around town, with a smooth, relatively soft suspension, and smooth, responsive performance in stop-and-go traffic. Rough city streets are subdued yet it’s delightful on country roads. A new six-speed automatic transmission on 2006 models replaces last year’s five-speed automatic, and the front and rear styling has been revised. The Lexus SC 430 comes as one model ($65,355) that features a power retractable hardtop, a 4.3-liter V8, the new six-speed automatic transmission, and a long list of luxury features. It comes trimmed in buttery-soft leather with beautiful wood and chrome accents. Also standard is a navigation system and Mark Levinson® audio with nine speakers. A rear spoiler and run-flat tires are among the few available options. For the third consecutive year, Lexus is offering the SC 430 Pebble Beach Edition. Only 500 of the 2006 Pebble Beach Edition will be available in the U.S. Distinctive features for the Pebble Beach package ($2,000) include a striking combination of Tigereye exterior paint and Camel-leather interior as well as elegant Pebble Beach emblems. The 2006 edition will also be offered with a specially commissioned Lexus Tigereye luggage set. Safety equipment for all SC 430 models includes dual frontal airbags, side-impact airbags, anti-lock brakes, electronic brake-force distribution, Brake Assist, Vehicle Stability Control, and traction control. The 2006 SC 430 looks like no other Lexus. It's curvaceous and daring, a dramatic, eye-catching statement that resembles nothing else on the road. The front styling has been revised for 2006 with bolder two-bulb headlight clusters, and heavier brightwork surrounding a more sharply angular rendition of Lexus's trademark trapezoid grille. The front bumper is more pronounced, and the Lexus badge is bigger. The 2006 Lexus SC 430 has been upgraded with the Adaptive Front Lighting System (AFS), which helps drivers see around turns better at night. The system uses an on-board processor that calculates the optimum angle to illuminate a turn, then swivels the headlamp closest to the turn accordingly. The styling features an arched roof that leads to a rounded rear. 2006 models feature sophisticated LED tail lights that replace the multi-lens lamps used last year. Beneath its beltline the SC 430 is round and plump but pleasingly so. The bold, squatty stance is emphasized by its long wheelbase, exaggerated wheel wells, and 18-inch wheels. The design pushes the wheels so far out to the corners they almost seem to stretch the sheet metal behind them. The wheels have been redesigned for 2006 with a more wide-open appearance, with metallic gray spokes and flat titanium-look center inserts. Press a button and the lightweight aluminum hardtop quickly folds itself double and tucks into the trunk. With the top concealed below the trunk lid, the SC 430 looks fluid and fast. The optional rear spoiler further reduces the car's slick drag coefficient of 0.31 to an even slicker 0.30. Available run-flat tires eliminate the need for a spare tire and thus increase space in the trunk. The SC 430 features a lavish cockpit with contoured bucket seats swathed in buttery-soft leather trim. The seats are very comfortable and adjust in every imaginable direction. Rich, glossy wood, in burled walnut or new dark Espresso, graces the steering wheel, gear selector, and console and streaks across doors and dash. Wooden flaps conceal the audio unit and navigation system. A leather-padded armrest tops the console; lifting it reveals a handy storage bin. The cupholders work great. The SC 430's cockpit is commendably simple and well-organized, in spite of its sophisticated electronic gear and power-motivated controls. The driver faces a steering wheel that tilts and telescopes and incorporates handy switches for the cruise control. Immediately ahead are three chrome-ringed binnacles housing round analog gauges, with crisp white-on-black graphics and vivid red needles. The gauges are easy to read except fuel and temperature, which compete with the gear indicators for attention. Switches for windows and door locks dot the padded armrest on the driver's door. At the top of the center stack to the right are audio and climate controls, plus a video screen for the navigation system. The navigation system was upgraded for 2005 with improved graphics and new functions. The automatic climate system features independent controls for the left and right sides of the cabin. It has its own, separate LED display for temperature and air flow. It's easy to read and operate yet is quite sophisticated: Lap vents deploy automatically when the top is open to compensate for solar heating. The 240-watt Mark Levinson® stereo delivers amazingly good quality sound. The radio, cassette player, and six-disc, in-dash CD changer brilliantly reproduce music and voice through a seven-channel amplifier and nine speakers, including an eight-inch subwoofer. It maintains full harmonic richness and high audio resolution even when you're at speed with the top down. It's refreshingly easy to operate in spite of its sophistication, so you don't have to study the owner's manual to figure out how to use it. A button next to the climate system opens the top. Simply press the switch, a trunk flap rises, the roof folds and slips into the trunk, the flap closes and windows go down. Lurking behind the front seats are a pair of smaller, form-fitting rear bucket seats rigged with integrated headrests and three-point safety belts. But don't mistake the SC 430 for a four-seater. Those back buckets are painfully upright and are generally unsuitable for humans. Better to use them as a relief storage shelf for the diminutive trunk. Like other sports cars, the SC 430 is not the best car for picking someone up at the airport. Luggage space is lacking with just 8.8 cubic feet of trunk room. Removing the spare tire expands that to 9.4 cubic feet. Dropping the top eliminates the trunk entirely as a serious storage area. However, the Lexus offers considerably more luggage space than you'll find in the Porsche 911 Carrera Cabriolet or Cadillac XLR, and slightly more than what's provided in the Mercedes-Benz SL 500. Yet it's a bit smaller than the boot in the Jaguar XK8. The Lexus SC 430 blends performance and agility with smoothness and luxury. With the top up and symphonic sound swirling through the leather-lined cabin, the SC 430 isolates its occupants from noise and rough roads. Its engine and transmission are very smooth and the suspension handles bumps and road undulations superbly, far better than most cars. Drop the top and the wind swirls above you. Wind buffeting is minimal at normal highway speeds and even at high speeds there's little buffeting. It's easy to conduct a conversation without raising your voice. The Lexus SC 430 is not a sports car in the sense of a Porsche 911 Carrera Cabriolet. With its soft suspension, the SC 430 floats and wallows on winding, bumpy roads. Take it to the limit in a tight corner, and it understeers (the front tires lose grip before the rear tires). It offers neither the grip nor the transient response of the 911, the Mercedes-Benz SL 500, the Jaguar XK8, or the Cadillac XLR. The SC 430 is enjoyable to drive, however. In fact it's quite wonderful at a brisk pace on winding mountain roads. Its rear-wheel drive is the proper layout for a performance car, giving it handling balance and responsiveness that no front-wheel-drive car can match. But the SC 430 is not intended to be driven like a race car. It is, after all, a Lexus, designed to excel in the areas of comfort and refinement. Similarly, the SC 430 is quick, if not lightning quick. It's capable of accelerating from 0 to 60 mph in less than six seconds. The double overhead-cam 4.3-liter all-aluminum V8 produces 288 horsepower at 5600 rpm and 317 pound-feet of torque at 3400 rpm. (The numbers are down slightly this year because of a change in the Society of Automotive Engineers test procedures. Power and torque are actually the same as last year, just measured differently.) The SC 430 offers acceleration performance comparable to that of the Mercedes SL 500 and Jaguar XK8, which is fast company, but it isn't as quick as the Porsche 911 or Cadillac XLR. Top speed of the SC 430 is electronically limited to 143 mph, more than fast enough. Around town, the Lexus is smooth, quiet and sophisticated. The four-cam V8 delivers strong torque at low rpm, and has a flexible powerband, which gives it solid, smooth response around town. These are benefits of the VVT-i variable-valve timing and drive-by-wire electronic throttle control. Adding to the smooth power delivery is a new six-speed automatic transmission, with Formula 1-style sequential manual override for when you feel like shifting for yourself. Active safety features help the driver maintain control by reducing the chance of a skid. ABS prevents the brakes from locking up to help the driver maintain steering control in a panic-braking situation. Electronic brake-force distribution enhances control under hard braking. Brake Assist helps maintain full braking pressure when the system determines that the driver is responding to an emergency but relaxes pressure on the brake pedal. Vehicle Stability Control helps maintain traction and direction by sensing the onset of a skid and adjusting throttle and brakes to help keep you on track. Traction control reduces rear wheel spin when accelerating on slippery surfaces. Passive safety features include seatbelts with pre-tensioners and force limiters and emergency locking retraction. They are excellent seatbelts, so be sure to wear them as they are your first line of defense in an accident. The SC 430 is equipped with side-impact airbags in addition to the mandated dual frontal airbags. 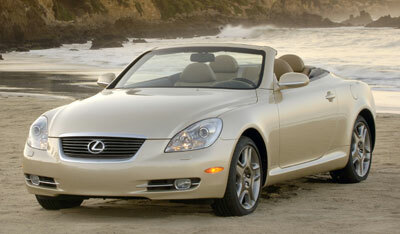 The Lexus SC 430 is a luxurious roadster that converts to a hardtop coupe with the press of a button. It's smooth and quiet, powerful and enjoyable to drive. Its interior is beautiful, comfortable, and luxurious. It's a terrific car for a long drive assuming you pack light. Though it has a vestigial rear seat, the SC 430 is, for all practical purposes, a two-seater. This review was produced by New Car Test Drive, the editorial office of which is based in Redondo Beach, California. Head/hip/leg room, f: 37.2/55.7/43.6 in. Head/hip/leg room, r: 33.9/49.5/27.1 in. Cargo volume: 9.4 cu. ft.